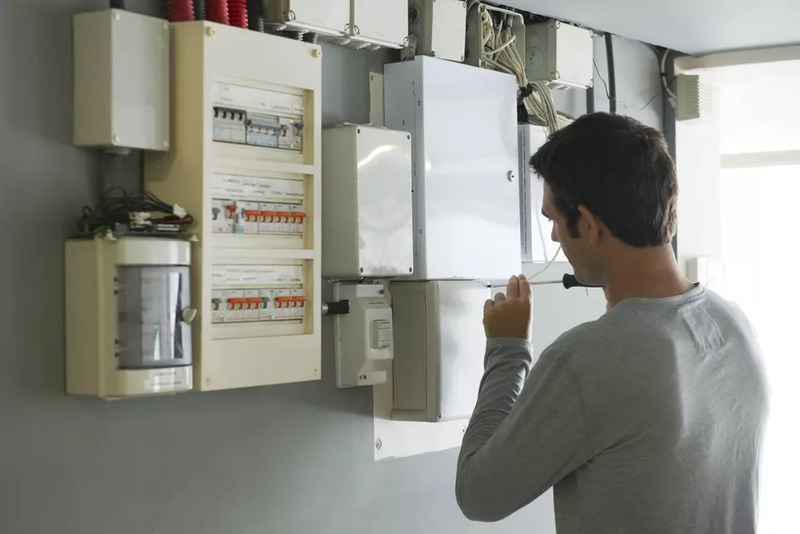 How to Turn off the Power at Your Home's Breaker Box or Fuse Box | Diamond Life Real Estate, Inc.
01of 05 Controlling Power at Your Home’s Electrical Service. All homes have an electrical service panel, commonly known as a breaker box or fuse box. The panel receives the incoming power from the electrical utility and distributes the power to the various circuits of the house. Turning off the power at the electrical service panel is the safest way to shut down a circuit before working on it. The service panel also allows you to shut off the power to all of the circuits at once, using the main breaker or main fuse. After shutting off the power to a circuit, always test for power in the wires and devices you will work on or near, using a non-contact voltage tester, before touching any wires or devices. Warning: The main breaker or main fuse does not shut off the power to the incoming service lines from the utility or the connections where those lines meet the main breaker or fuse inside the service panel. The lines remain live—carrying deadly levels of electrical current—unless the utility company shuts them off. 03of 05 Turning off Before working on any circuit, such as when replacing a switch or upgrading an old outlet to a GFCI outlet, you must turn off the power to the circuit—and that is the purpose of the branch circuit breakers. Identify the correct breaker for the circuit by using the directory (usually stuck to the back of the service panel door) or the writing next to each breaker. Once you find the circuit breaker, simply flip the breaker’s toggle switch to the OFF position. If you can’t identify the correct circuit breaker for the circuit you will work on, or if the breakers are not labeled, you can use an electronic circuit breaker finder to positively identify each circuit. 04of 05 Using the Main Disconnect in a Fuse Panel in older homes may have service panels with fuses instead of breakers. Fuse panels typically contain one or more blocks that contain cartridge fuses. One of these blocks serves as the main fuse, or main disconnect, for the service panel and all of the branch circuits. Each of the other blocks usually serves a 240-volt appliance, such as an electric range or clothes dryer. The fuse box also contains a number of screw-in fuses serving individual branch circuits. To shut off the power to all of the branch circuits, grip the handle on the main disconnect block—using one hand only—and pull straight out to remove the block completely from the panel. Using one hand is a safety precaution to prevent electrical current from passing easily through your body in the event of a short circuit. 05of 05 Turning off Branch circuits that are controlled with fuses that have threaded ends that screw into sockets in the fuse panel. To shut off the power to an individual branch circuit, unscrew the fuse while touching only the rim, or face, of the fuse. Unscrew it all the way and remove it completely from the socket. Do not touch the metal threaded base of the fuse while removing the fuse from its socket. Screw-in fuses come in two main types: Edison fuses have large threaded sockets that look just like light bulb sockets. Type-S, or “Rejection,” fuses are similar to Edison fuses but have smaller threaded bases. In an old fuse panel, there may be Edison-type sockets containing adapters that accept Type-S fuses that prevent users from installing the wrong type of fuse and creating a potential fire hazard.